decreasing the isolation people feel when things aren’t great. WHY SHOULD YOU BE INOLVED? A Mental Health Month project or event is a great way to encourage awareness of mental health, and social and emotional wellbeing in your community. It can decrease stigma, and empower people to seek help, for themselves or others. A Mental Health Month event or project can give people people from your community the awareness and the courage to consider mental health and social and emotional wellbeing something that they can work on. Mental Health Month events can be fun, thought-provoking, creative, engaging, sporty, and interesting. 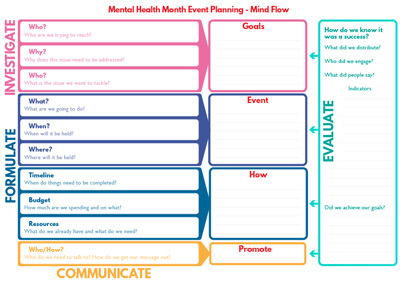 This kit includes information and worksheets to help you plan an event or project for Mental Health Month, as well as information about applying for one of WayAhead’s small grants. If you are planning a particularly large event then the Big Event Starter Kit can offer you some additional help. Identify the issue – What do you want to address? General awareness? Reducing stigma? Increasing access to services? Think about why this issue is important – To you, your organisation, your community. Understanding the issue will help keep your event on-track, and help you determine the goals for your event. Identify your target audience and research how best to reach them – What has worked in the past? Use your own expertise here – do people come together over food? Music? Maybe you can combine a few approaches to reach more people. Identify your goals – What do you want to achieve. Think broad, rather than specific. What’s the aim of the project or event? This should reflect the issue you’ve identified, as well as your target audience. This is the stage where you use everything from step one to actually plan the event or project you want to create. The information from step one should inform what your project or event looks like. Plan a message – Something cohesive and catchy that ties your event or project together. Think about the issue and the goals you have identified, and how you want to capture that. Plan the event – What type of event or project best suits what you’ve identified? Where will you hold it? Think about this stage strategically, and break it down into as many steps as you need. Plan what you need – what do you need to host this event or project successfully – materials/supplies, staffing, time? Creating a visual plan can help to work this out, including a timeline. Having lots of small time-based goals can help ensure everything gets done in time. Connect – Connecting with other organisations and groups can help promote the event, pool resources, and find new opportunities for your event or project. It can help you reach more people with your message. Connect – How do the people you work with tend to connect best? Social Media? Newspaper? Support Groups? This kind of promotion means you’re meeting people on their own ground, and making use of systems already in place. Don’t forget to invite people directly as well. Promote – Think about how best to promote your event or project. Make use of local media, and think creatively about how best to reach as many people as possible. Professional looking posters can make a difference, but not every organization has access to a graphic designer. There are some free online tools such as ADOBE SPARK which can help design great posters without design knowledge. Promote – There’s a media guide included in this starter kit with even more ideas for promoting your project and event. Check – Having a framework for evaluating your project will help make sure your project or event stays true to the goals you’ve identified, and let you know that you’ve been successful. It can be complex or simple. What you’ll want to measure? Outcome evaluation – Has the desired effect been achieved? Are people seeking help more? Making contact? This can be difficult to measure, so it can be helpful to think of one simple thing that can be easily tracked – like number of people who have signed up to your mailing list, or people who have liked, shared, retweeted or commented on your social media posts. Implementation evaluation – Did you stick to your plan? Did your project get through unexpected challenges? Goals evaluation – Have you achieved the goals you decided on? It can be good to think about how you will evaluate the project/event from the beginning, to make sure the evaluation framework fits the project. It can even form part of your event – for example, people can post selfies using a specific hashtag, or write their thoughts or feedback on a large board, each of which can be counted and used for evaluation. Use these to brainstorm and lock in your event ideas! WayAhead provides small grants to help get your Mental Health Month event off the ground. 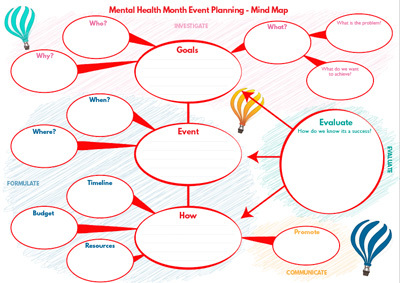 Is your event taking a new approach to mental health promotion? A creative way to reach people? Or is it a new way of delivering a tried-and true message? What makes your event stand out? Will your event or project reach hundreds? Thousands? Or just a few in a significant way? Are there chances for “incidental” involvement with people who might not have heard about your event – people walking past maybe? Is your event accessible? Out in public where lots of people can engage? Have the steps been thought through? Have challenges been thought through and addressed? How does your event or project centre the “Share the Journey” theme? “Share the Journey” has been chosen as the theme because of the positive impact it can have on mental wellbeing. Connections and community are proven to increase positive mental wellbeing, so we are definitely looking for events and projects that incorporate this theme. Have you connected with other organisations in your community? Who will you share the journey with? Making use of the resources and expertise of multiple organisations and groups increase the reach and success of events and projects. Think about other organisations you might partner with. Overall, we are looking for an event or project which incorporates all these things cohesively – does it make sense as a whole? We aren’t looking for perfect spelling or grammar, but it can help to have someone look over your application to make sure it’s clear and easy to understand. We have a panel of judges – a least two for each category – and for the target categories the judges must have experience with those communities. There is a clearly written guide for the judges, so they can mark the applications according to the same score sheet each time. After that the judges will meet in person to see if their scores match up and decide on the final recipients. Application forms need to be submitted online through our portal HERE. You will be able to go back and edit your responses right up until the closing date, but we also have a copy of the questions available to download HERE for you to work on before submitting the application. We’ve tested the form, but if you have any difficulties filling it in, submitting it, or just have questions, please don’t hesitate to get in touch. We’re happy to help. We have both $1000 and $500 grants. Grants that are unsuccessful in the $1000 category will automatically be considered for a $500 grant – please indicate if you do not wish to be considered for the $500 grant. If you have any questions about the judging process please get in touch. A big part of Mental Health Month is that we increase public awareness of mental health and wellbeing. It also means that, for some people, this increased awareness can bring up some difficult thoughts or feelings. During your event or project, people might approach you with varying levels of concern or distress. It’s important to know how best to support them, and yourself, whilst respecting the boundaries of the event, the other person, and yourself. Avoid making judgements about behaviour that may seem unusual to you. If someone is talking with you about their mental health, they trust you to be understanding and non-judgemental. Avoid giving advice, including about diet, substance use, or other choices – this advice can feel like a judgement. Respect that people are entitled to determine their own course of action. It is up to them what they do with the information available to them. Identify people that can support you if something comes up that is difficult or upsetting, and let them know that they might need to do that for you on the day. Remember that looking after yourself and your team is just as important as looking after others. Consider getting together before the event to have a chat about your plan and after the event to talk about how you think things went and to celebrate. Keep an eye out for each other on the day. It’s important to think about how you’re going to promote your event or project, and some of the most effective channels are probably already familiar to you – social media, posters and flyers, email invitations – but it can also help increase awareness of your event to engage with local newspapers and other local media outlets. Even if you are holding a private event (not open to the public), you may still wish to tell the media about it beforehand so that a journalist can attend part of the event and write a story about it to go into the local paper afterwards. Alternatively, you can write your own media release and send it to local print, radio and TV journalists. We have provided a template media release below as a guide. Mental Health Month events are a great opportunity for media to bring attention to mental health – and your event provides a good reason for them to do this. Working with the media is one more way that we can promote positive mental health and reduce the stigma surrounding mental illness. If you are holding a public event, then using the media is a great way to get more participants. How to get in the media? Target your media release carefully. Don’t send a release about a book launch to the sports writer, and don’t send one email to multiple journalists. Address them by name and take a sentence to introduce yourself, and if you’re not sure who to talk to call a general office number first and ask. The person you speak to may not report many mental health stories, so be prepared to explain terms or direct them to other resources for more information. MINDFRAME have some good resources. Keep in touch with your media contacts after the event is over. Even if they haven’t run a story yet, if you can provide good photos and details on how successful the event was it may become more newsworthy. Whatever the outcome, make sure to say thank you for their time. Mental health issues will affect 1 in 5 Australians every year. Anxiety disorders are often the most common mental health challenge, followed by depression. Mental Health Month is co-ordinated every October by WayAhead. This year the theme is ‘Share the Journey’. People across NSW & Australia come together during the month to hold events and promote good mental health and wellbeing in their local communities. These events are a useful reminder for all of us to think about the mental health of ourselves and those around us. It’s also a good excuse to get out there and have some fun! Be careful with your spelling and grammar, if you’re unsure, it’s always good to have a couple of people proof read your media release before it goes out. Keep it short and interesting. Journalists are often busy and see loads of media releases, so you want to make it as easy as possible for them to understand why your event is newsworthy. Try to keep your language simple and avoid over-hyping your story. An art exhibition doesn’t have to feature the next Van Gogh to be newsworthy and interesting to local readers, so be enthusiastic but don’t exaggerate. Let them know if there are photos available or they can take photos on the day. A great photograph can often help get a story published. Use quotes from interesting spokespeople. This can include people from local businesses and organisations that are supporting you, local people planning to attend, or any prominent people from the local community involved in the event itself. Remember to ask them why they think your event is going to be great for your community – it’s an easy way to show your newsworthiness! Each year we see some incredible, creative, exciting events happen during Mental Health Month, and we’ve featured a few of them here to inspire you! A a festive event celebrating the wisdom of the elder years by incorporating contemporary performance practice. Utilising the existing regular over 60’s Monday Social Hub attendees and the 60+ PERFORMANCE participants, as active hosts for the event. The event, which welcomes the general community, will shine a light on some local everyday heroes and ask them to share their journey, advice and tips. The Enemy Within is a two-day event of workshops and presentations delivered by Joe Williams – a former NRL player sharing his lived experience with mental health. Presentations will focus on connecting with the Indigenous community through the Wakagetti Dance Team based in Muswellbrook. Presentations will also focus in suicide prevention and wellbeing education. Art 4 Connection Workshop & Creative Presentation is an event incorporating a ‘hands on’ workshop that will explore how art facilitates wellbeing, insight and healing through expression. The workshop will be facilitated by four specialist Art Therapists who work with individuals and local community groups with a diverse range of needs. The workshop will also include presentations by all four art therapists which will provide the overarching framework and themes for the day. Morning tea and lunch will also be provided. ‘Misery Loves Company – Sharing the Darkness to Lighten the Load’ by Waitling & Bates is an event showcasing a selection of original songs and covers that express feelings that are difficult to discuss. There will also be a short performance by two local artists living with anxiety and depression. The event will also include a shared dinner before the show. Standby Response, an organisation dedicated to supporting people and communities bereaved by suicide, will also present a talk about grief and grieving in rural communities and provide some self-care strategies. The Mind Your Art Competition targets young people aged 12-25 in our local community by providing an opportunity to express themselves through art, while focusing on the importance of mental health and early intervention. This event will be held at the Glasshouse Port Macquarie which exhibits some of the best artists in the world and offers our entrants a unique opportunity to exhibit their own works. An opening night will be held at the beginning of October. The exhibition will run for the whole month to raise mental health awareness and will be accessible to the whole community. Pasifika – Be Young and Well is an event emphasising on the importance of keeping well mentally and why it’s vital for young people to look after their mental health. We will include dancing and singing from the young people of the 5 different Pacific communities in between the talks from health professionals but also an NRL player of Pacific background. The program will be concluded with a panel Q&A and a lunch which will include healthy traditional food and drinks. Batiba Guwiyal Healing and Cultural Renewal Workshop’s includes three morning workshops held across three days based on healing and psychological empowerment that addresses the impacts of trans-generational trauma and domestic and sexual violence, through Yarning Circles, Aboriginal arts and cultural practices, expressive arts therapy, capacity building activities and trauma education. Workshops will be open to all Aboriginal women in the community. All ages LGBTIQA+ and straight allies event – Pride March and Fun Day in the Park. The purpose of the Pride March is to highlight and celebrate the diversity of the Central West community. The march will hold floats of various organisations and business’ such as Australian Post, banks, headspace Dubbo, Uniting and Community Members. The Fun Day in the park will involve various mental health stakeholders setting up stalls to provide information of relevant services, as well as activities for all ages including Zumba lessons, tae Kwan doe sessions, face painting, jumping castle, speeches from members of the LGBTIQA+ community and live music.